Jan Latta is the author of 11 books for children in her True to Life series about endangered animals. 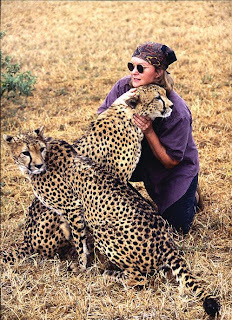 She is also a wildlife photographer who travels to dangerous places to take pictures for her books. In 2007 she was commissioned by the ABC to write about her adventures on location in Diary of a Wildlife Photographer. Jan chats to us about why she risks her life to create books for young readers. 1. What inspired you to become a wildlife photographer and author? In 1994 I went to Rwanda and came face to face with a mountain gorilla. When I found out there were only 600 of these magnificent creatures left in the wild I felt like I had to do something. I decided to publish books for children so that they would know about the plight of these animals. 2. Have you always been an author and wildlife photographer? No, I used to work in advertising. I taught myself to be a wildlife photographer so that I could tell the animal's stories in pictures as well as words. 3. What animals have you written about and photographed so far? Mia the Meerkat, Gerry the Giraffe, Ping-Ping the Panda, Chipper the Cheetah, Timba the Tiger, Rufus the Rhinoceros, Chimaka the Chimpanzee, Lena the Lion, Elle the Elephant, Kolah the Koala and my most recent release is Ollie the Orangutan. 4. What are your books about? Each story is fictional, but it's a true to life adventure that features a different animal who talks to the children about where they live, what they eat and how their family lives together. For example, in Ollie, the Orangutan, Ollie is your guide and companion taking you on a voyage of discovery into his world. At the back of the book there are lots of Orangutan Facts and information on how you can help this endangered animal. There are also maps and a list of websites and books for further reading. 5. How far have you travelled to gather the research for your books? I have travelled to Africa eight times, China and Borneo twice and also to India. I spend two to three weeks in a location and I follow animals every day, taking photographs and writing about them in their natural habitats. 6. Can you tell us how you live when you are on location? I live in tents with no running water and wild animals walk through my camp. 7. You travel to dangerous places when you're doing research for your books. What are some of the most frightening things that have ever happened to you? When an elephant the size of a double-decker bus charged our jeep and on one trip our jeep broke down and we were left stranded in a herd of buffalos. 8. Why do you keep risking your life to create your books for children? Despite the dangers it's a great privilege to be able to photograph endangered animals in the wild, then write their stories. I love what I do. I love the challenge of being in the wild and searching for the animal that is the focus for my next book. I love talking to schools about my adventures, creating my books and helping children understand the importance of saving endangered animals. Jan is a popular speaker at schools, libraries and festivals in Australia, Japan, New Zealand, China, Hong Kong and Singapore. Her books are available from True to Life books where you can find out more about Jan's adventures on her blog. View a YouTube clip of her adventures.